Do some good so you sleep well. 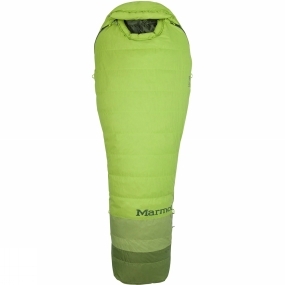 The Mens Never Winter TL Long Sleeping Bag from Marmot is part of Marmot's initiative that brings eco conscious practices to the sleeping bags. Marmot collected old down comforters, down jackets and other items from landfills and upcycled the stuffing. The result is a water-resistant 650-fill down bag boasting eco-conscious, recycled products and processes giving camping and river trips even more to feel good about.